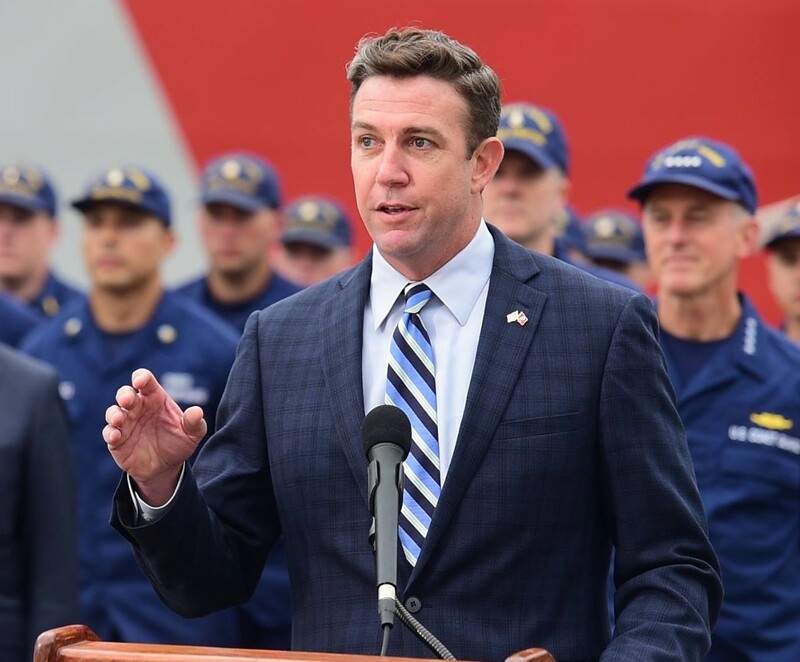 EDITOR’S NOTE: This story was updated at 2:08 pm with additional details from Thursday’s arraignment, quotes and a link to an inewsource article by Jill Castellano on Rep. Duncan Hunter’s re-election campaign finances. REGION — Rep. Duncan Hunter, R-Alpine, and his wife Margaret pleaded not guilty today to federal charges of using more than $250,000 in campaign funds for personal expenses, including family vacations, dental bills, theater tickets and international travel for relatives. The judge also noted that the pair do not present a flight risk. The pair were given until Tuesday to post the bond amount. They are both due back in court Sept. 4. After processing, Duncan Hunter — a former Marine — walked briskly out of the federal courthouse without speaking to reporters. Protesters chanted “shame, shame” as the congressman made his way to the street. Hunter’s attorney, Gregory Vega, said the case against his client was politically motivated. “The congressman has faced more difficult battles than this, in Iraq and Afghanistan,” Vega said. “He looks forward to his day in court, and we will do everything in our power to represent him. Prosecutors Phillip Halpern and Mark Conover did not comment as they left the courthouse. The Hunters were indicted Tuesday by a federal grand jury in San Diego on charges of conspiracy to commit offenses against the United States, wire fraud, falsification of records and prohibited use of campaign contributions. On Wednesday, the 41-year-old Hunter blasted the timing of the indictment, saying the Department of Justice decided to take the action right before the general election in November. Although he represents a solidly conservative district, Democrats have been targeting his seat — thanks largely to the federal investigation of Hunter. The congressman called the two-year investigation leading up to the indictment a “witch hunt,” saying it was politically motivated. He said he would continue to fight to clear his name. Among the personal expenses they allegedly funded with campaign cash were family vacations to locations such as Hawaii and Italy, along with school tuition and smaller purchases such as golf outings, movie tickets, video games, coffee and expensive meals. The couple allegedly mis-reported the expenses on FEC filings, using false descriptions such as “campaign travel,” “toy drives,” “dinner with volunteers/contributors” and “gift cards,” according to federal prosecutors. Hunter was a member of the Transportation and Infrastructure Committee, and chairman of its Subcommittee on Coast Guard and Maritime Transportation, the House Armed Services Committee and Education and the Workforce Committee. Hunter was elected to Congress in 2008, after his father opted not to seek reelection.